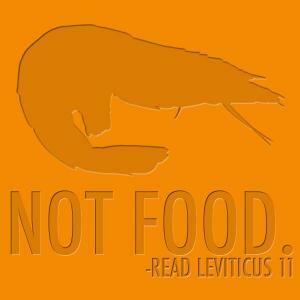 Does a Genesis Day Begin – Evening or Morning? So when does a Genesis day begin – in the evening or morning? Genesis 1 has more mistranslations in any one chapter than in any other book of the Hebrew Bible, starting with the very first word, which is a normal construct in Hebrew, “ Young’s Literal translation has it correct, “In the beginning of…” (YLT). The difference is not trivial, but has profound implications for the philosophy of time and Biblical Chronology. So when does a Genesis day begin and where does scripture clearly indicate that the morning or evening starts the Genesis day in our Bible? First he calls the light day. The text then switches to a conjunctive waw, “and darkness” followed by a switch in verbal tense to “he has been calling night”. Added background information here for darkness, does not interrupt the sequence in the provision of detail. So it is NOT introduced with a consecutive waw, as if to say, “then he called the darkness night” which would make it hard to say “then there was setting” right afterwards. English does not use a perfect for this purpose but uses a gnomic present tense, “he calls”. Then there was setting. Then there was daybreak. 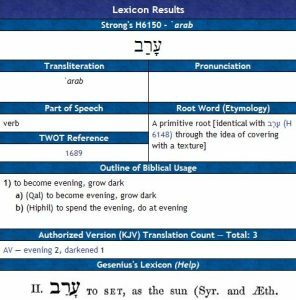 The waw consecutive here (translated then) shows that the “evening”, or more literally “setting” in Hebrew, follows next in time after the day: Then there was…. Thus, the setting of each day is always after the creative acts of the day. The setting and the daybreak mark the boundaries of the night that follows the day. The word עֶרֶב is derived from the verbal root ערב, which means “go down,” “grow dark,” “set” (HALOT, BDB, Holladay). This Hebrew verb, by regular rules, is formed into a noun. It is important to note that עֶרֶב means “going down,” “setting,” or “growing dark.” Everett Fox, translator of the Schocken Bible, renders “There was setting, there was dawning: one day” The sequence is established, first setting, then daybreak. The King James Version mistranslates, “And the evening and the morning were the first day.” The KJV deletes the verb twice, turning it into two noun phrases, and then inserts the verb at the end of the sentence where it does not belong. The effect is to form an equation: evening + morning = 1 day. The first phrase in the KJV “And the evening” is a noun phrase, and the second clause “and the morning” is also a noun phrase. Noun phrases in Hebrew only take waw conjunctive. In Hebrew the words are verb phrases, “Then there is setting. Then there is daybreak: one day.” Verb phrases in Hebrew take the waw consecutive, and such is the case here. Where the KJV inserts the word “were” in “were the first day,” there is no verb at all in the Hebrew. The mistranslation is so atrocious to anyone knowing Hebrew that the only sound conclusion is that the KJV translators vested interest was not in achieving accuracy, but in maintaining the tradition that a Scriptural calendar day is from sunset to sunset. And choosing tradition above the words and commandments of God is not faithfulness. 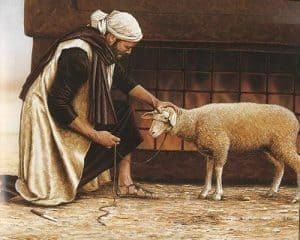 The Passover lamb (Num 28:3) was to be slain ‘between the settings’ on the 14th day of Aviv – the first month of the Hebrew year. The Hebrew word ervayim is is made of the word erev (עֶרֶב) and the dual ending ayim (יִם). The dual ending is often confused with the plural ending iym. The dual ending means a plural of two. So the word עֶרֶב means the ‘setting’, or the ‘going down’ of a light source. Strictly erev refers to the ‘setting’ of some light source.